Next week, on Shabbat Vayeshev, November 30th - December 1st, we welcome as our Shabbat Scholar-in-Residence, Dr. Malka Simkovitch, the Crown-Ryan Chair of Jewish Studies and director of the Catholic-Jewish Studies program at Catholic Theological Union in Chicago, as well as a Core Faculty member of Drisha Institute. Please join us on Friday night for a delicious and social Community Shabbat Dinner, and join us as well over Shabbat for a thought-provoking series of talks and discussions on Chanuka for Grown-Ups, Joseph as Hero of the Diaspora, and Women's Leadership within Orthodoxy Judaism. Join us as well on Thursday, November 29th, at 7:00 PM for an evening to celebrate the publication of Dr. Simkovich’s new book - Discovering Second Temple Literature: The Scriptures and Stories That Shaped Early Judaism (Philadelphia: The Jewish Publication Society, 2018). For more information, please visit the event page. Reservations for the Friday night dinner should be made by Tuesday, November 27th. "The Chanukah Story, For Grown Ups"
"Joseph, Hero of the Diaspora"
A Q & A with Dr. Simkovitch"
Dr. Malka Simkovich is the Crown-Ryan Chair of Jewish Studies and director of the Catholic-Jewish Studies program at Catholic Theological Union in Chicago, as well as a Core Faculty member of Drisha Institute. She earned a doctoral degree in Second Temple and Rabbinic Judaism from Brandeis University and a Masters degree in Hebrew Bible from Harvard University. Malka’s articles have been published in such journals as the Harvard Theological Review and the Journal for the Study of Judaism, as well on online forums such as TheTorah.com, The Lehrhaus, and the Times of Israel. Her first book, The Making of Jewish Universalism: From Exile to Alexandria was published in 2016, and her second book, Discovering Second Temple Literature: The Scriptures and Stories That Shaped Early Judaism, was published by the Jewish Publication Society in 2018. Malka is currently completing a commentary to the book of Zechariah which will be published in 2019 by Liturgical Press. A native of Philadelphia, Malka lives in Skokie, Illinois, with her husband Aaron and their four children. The Wednesday night classes in Foundations of Judaism & Rabbinic Storytelling will not meet tonight, November 21st. Classes will resume on November 28th. See the shul calendar for davening times and events. Mincha/Kabbalat Shabbat - this week at 4:20 PM - is held shortly after candle-lighting time. Please join us this Shabbat and enjoy a beautiful davening, thoughtful Torah study, and a wonderful community. With the dramatic growth in our Shabbat attendance, most significantly on Friday nights and Saturday afternoons, our Beit Midrash no longer adequately meets our needs. Moving forward, we plan to hold Shabbat services in our main sanctuary exclusively, for the foreseeable future. In these tragic and scary times we stand with all those victimized by senseless hatred and fanaticism, at home, in Israel, and abroad. We pray for safety, healing, and peace. We wish a Mazal Tov to Dana & Philippe Gerschel on the birth and naming of their daughter Ray (רחל). Tot Shabbat THIS Shabbat! Children and their parents are invited to Tot Shabbat this Shabbat, Parshat Vayeitzei, November 17th, featuring our newly hired Early Childhood Educator, Leat Klingman. Please join us for open play in the Beit Medrash at 10 AM, followed by the formal Tot Shabbat program promptly at 10:45 AM. Parent participation and feedback helps us create a nurturing and educational environment for our youngest members--so join us on November 17th! 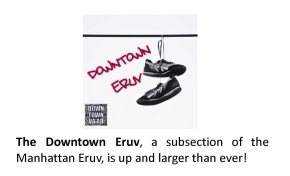 The Downtown Community's yearly financial Eruv obligation is $36K. These funds are raised by several synagogues and institutions, as well by many individuals and families that make use of the Eruv. How much to give is certainly up to you, and any donation is appreciated. To give you some context: If 200 families/individuals were to give $180, this year's fundraising effort would be over. To make a payment, please do so here, or send in a check to the office. If you send a check, be sure to specify that this donation is for the Eruv. Shabbat Scholar Dr. Malka Simkovich - November 30-December 1: Please join us on Shabbat Vayeshev (November 30 - December 1) when we welcome as our Shabbat Scholar-in-Residence Dr. Malka Simkovich (Drisha Faculty member and Professor of Jewish Studies at Catholic Theological Union), who will speak on the Chanukah story for grown-ups, Joseph as hero of the Diaspora, and women's leadership in Orthodoxy. There will be a Community Dinner on Friday night. For more details and to register for the dinner, please visit the event page. Woman's Tefilla & Torah Reading - December 15th: All women are invited to join us on December 15th, Parshat Vayigash, for a Women's Tefilla and Torah Reading. If you would like a role such as reading the Torah, or have any questions, please email Tali Zilberman. Sixth Street Parents Committee: Our Sixth Street parents committee is planning a number of events for our youngest members and the larger community, and we want you to know about them! The Sixth Street Parents Google group is where events are publicized, meetings are called, and babysitters' contacts are shared. If you'd like to be added to the group, please email Jeremy. Torah Readers: We are looking for men who can prepare to read at Shabbat Mincha (and possibly at Shacharit during the week as well) throughout the year. A schedule of readers is being maintained. If you can commit to any dates, please contact Rabbi Bellino. We are grateful to Elie Yudewitz who will read this week. The next available Mincha leining is on November 24th (the afternoon reading is Vayeshev). We are looking for women to prepare aliyot for a Women’s Torah Reading in the near future. Rabbi Bellino is happy to help anyone learn how to prepare a reading. Recycling: Please make sure that all bottles, cans, and tins, are placed in the blue recycling bin in the social hall. We can be fined by the city for not separating out our garbage for recycling, and your help will save our maintenance staff a lot of work, and the synagogue some money. Please continue to assist our weekday morning Minyan. Consider increasing your commitment to community and synagogue by attending. Our plentiful and delicious Kiddushes on Sixth Street greatly enhance our synagogue and community. To sponsor or to co-sponsor a Friday night Kiddush, a Shabbat Kiddush, a Shabbocktail, our Shabbat Shabeer supply, or a Seudah Shelishit, contact Rabbi Bellino. The next available Shabbat Kiddush for sponsorship is Shabbat Vayeshev, December 1st. Please join us to celebrate the publication of Dr. Malka Z. Simkovich’s new book - Discovering Second Temple Literature: The Scriptures and Stories That Shaped Early Judaism.Talks will be given by Dr. Malka Z. Simkovich (Drisha Faculty member and Professor of Jewish Studies at Catholic Theological Union) and Dr. Lawrence Schiffman (Professor of Hebrew & Judaic Studies at NYU). We'll explore the Jewish literature and communities of Alexandria and the Dead Sea Scrolls in Greek and Roman times, as Jews navigated as a minority through worlds dominated by powerful cultures. This event has been sponsored by Drisha, The Jewish Publication Society, and our synagogue. Please register on the event page. In two weeks, on Shabbat Vayeshev, we welcome our next Shabbat Scholar-in-Residence, Dr. Malka Simkovich (Drisha Faculty member and Professor of Jewish Studies at Catholic Theological Union). For more details and to register for the Friday night dinner, please visit the event page. On Sunday, December 2nd, from 10:30 AM - 12:30 PM, we will be hosting our annual Children’s Chanukah Party. Join us in our social hall for food, fun, arts and crafts, and a holiday sing-along led by Rabbi Bellino. Please register on the website. FOUNDATIONS OF JUDAISM: A sensitive and sophisticated introduction to Judaism, intended for beginners, and focusing on many of the ritual, legal, linguistic, and philosophical basics of our faith. Wednesdays 6:30-8:00 PM. RABBINIC STORY TELLING: A literary analysis of the stories told by the Rabbis of the Talmud. Wednesdays 8:00-9:00 PM. SHACHARIT: Miriam Kaplan on Shacharit, the daily morning prayer. Shabbat, following Kiddush. We are thrilled to have Shifra Friedman as the Yoetzet Halacha for the downtown community. Yoetzet Shifra is available to answer questions related to Toharat HaMishpacha and may be reached by phone at (646) 598-1080 and by email. Click here to read our recent e-mail about her appointment. 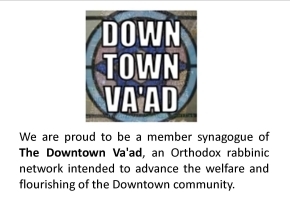 We are proud to be a member synagogue of The Downtown Va'ad, an Orthodox rabbinic network intended to advance the welfare and flourishing of the Downtown community. Check out the Va'ad on Facebook for more information. We encourage your participation and insight. Feedback to Elie Yudewitz, Rabbi Bellino or the Shul Office would be most appreciated. Please contact us with any suggestions and/or concerns, or most importantly, to volunteer. You can also make suggestions here. We like to have fun and be creative on social media. Like us on Facebook to see more updates! We like to think we're different. Everyone from the traditionally Orthodox to the occasionally observant feels at home here - 365 days a year. We hope you do too. Foundations Classes & Rabbinic Storytelling Class Tonight! The Wednesday night classes in Foundations of Judaism will meet tonight, Wednesday, November 14th. Rabbi Bellino will also continue his new class at 8:00 PM in Rabbinic Storytelling, focusing on a literary analysis of the stories told by the Rabbis of the Talmud. In two weeks, on Shabbat Vayeshev, November 30th - December 1st, we welcome as our Shabbat Scholar-in-Residence, Dr. Malka Simkovitch, the Crown-Ryan Chair of Jewish Studies and director of the Catholic-Jewish Studies program at Catholic Theological Union in Chicago, as well as a Core Faculty member of Drisha Institute. Mincha/Kabbalat Shabbat - this week at 4:25 PM - is held shortly after candle-lighting time. Please join us this Shabbat and enjoy a beautiful davening, thoughtful Torah study, and a wonderful community. THIS SHABBAT - Special Seudah Shelishit / Musical Havdalah & Singalong: Now that we've changed the clocks and Shabbat is over before bedtime, we are thrilled that our youngest members and friends can join us for musical havdalah. Join us this Shabbat afternoon at 4:30 PM for a special Seudah Shelishit complete with kid-friendly food, then join the musical Havdalah with Rabbi Bellino. After Havdalah, Rabbi Bellino will lead a spirited kids singalong. Mincha at 4:10 PM / Seudah Shelishit at 4:30 PM / Musical Havdalah at 5:26 PM. Tot Shabbat Next Shabbat! Children and their parents are invited to Tot Shabbat next Shabbat, Parshat Vayeitzei, November 17th, featuring our newly hired Early Childhood Educator, Leat Klingman. Please join us for open play in the Beit Medrash at 10 AM, followed by the formal Tot Shabbat program promptly at 10:45 AM. Parent participation and feedback helps us create a nurturing and educational environment for our youngest members--so join us on November 17th! Wednesday, November 14th - Rabbi Bellino continues his classes in Foundations of Shabbat (7:00 PM) and Literary Study of Talmudic Legends (8:00 PM). The Downtown Community's yearly financial Eruv obligation is $36K. These funds are raised by several synagogues and institutions, as well by many individuals and families that make use of the Eruv. How much to give is certainly up to you, and any donation is appreciated. To give you some context: If 200 families/individuals were to give $180, this year's fundraising effort would be over. To make a payment, please do so here, or send in a check. Be sure to specify that this donation is for the Rabbi's Discretionary Fund and for the Eruv. Woman's Tefilla & Torah Reading - December 15th: All women are invited to join us on December 15th, Parshat Vayigash, for a Women's Tefillah and Torah Reading. If you would like a role such as reading the Torah, or have any questions, please email Tali Zilberman. Torah Readers: We are looking for men who can prepare to read at Shabbat Mincha (and possibly at Shacharit during the week as well) throughout the year. A schedule of readers is being maintained. If you can commit to any dates, please contact Rabbi Bellino. We are grateful to Rabbi Bellino who will read this week. The next available Mincha leining is on November 17th (the afternoon reading is Vayishlach). We are looking for women to prepare aliyot for a Women’s Torah Reading in the near future. Rabbi Bellino is happy to help anyone learn how to prepare a reading. Please join us to celebrate the publication of Dr. Malka Z. Simkovich’s new book - Discovering Second Temple Literature: The Scriptures and Stories That Shaped Early Judaism.Talks will be given by Dr. Malka Z. Simkovich (Drisha Faculty member and Professor of Jewish Studies at Catholic Theological Union) and Dr. Lawrence Schiffman (Professor of Hebrew & Judaic Studies at NYU). We'll explore the Jewish literature and communities of Alexandria and the Dead Sea Scrolls in Greek and Roman times, as Jews navigated as a minority through worlds dominated by powerful cultures. This event has been sponsored by Drisha, The Jewish Publication Society, and our synagogue. Please join us on Shabbat Vayeshev (November 30 - December 1) when we welcome as our Shabbat Scholar-in-Residence Dr. Malka Simkovich (Drisha Faculty member and Professor of Jewish Studies at Catholic Theological Union), who will speak on the Chanukah story for grown-ups, Joseph as hero of the Diaspora, and women's leadership in Orthodoxy. Please visit the event page for more details. On Sunday, December 2nd, from 10:30 AM - 12:30 PM, we will be hosting our annual Children’s Chanukah Party. Join us in our social hall for food, fun, arts and crafts, and a holiday sing-along led by Rabbi Bellino. The Wednesday night classes in Foundations of Judaism will meet tonight, Wednesday, November 7th. Rabbi Bellino will also continue his new class at 8:00 PM in Rabbinic Storytelling, focusing on a literary analysis of the stories told by the Rabbis of the Talmud. Mincha/Kabbalat Shabbat - this week at 5:35 PM - is held shortly after candle-lighting time. Please join us this Shabbat and enjoy a beautiful davening, thoughtful Torah study, and a wonderful community. Tot Shabbat This Shabbat! Children and their parents are invited to Tot Shabbat THIS Shabbat, Parshat Chayei Sara, November 3rd, featuring our newly hired Early Childhood Educator, Leat Klingman. Please join us for open play in the Beit Medrash at 10 AM, followed by the formal Tot Shabbat program promptly at 10:45 AM. Parent participation and feedback helps us create a nurturing and educational environment for our youngest members--so join us on November 3rd! In these tragic and scary times we stand with all those victimized by senseless hatred and fanaticism, at home, in Israel, and abroad. We offer condolences to the Tree of Life Synagogue community in Pittsburgh and pray for safety, healing, and peace. We share your sadness for the unspeakable loss in Pittsburgh, your anger at the social/political climate that enables such hatred, and your concern for our own community’s safety. Please click here for a full statement from our leadership. We offer continued Blessings of Consolation to the Gerschel Family upon the passing of Daniel's beloved Grandmother, Rachel 'Mamita' Feldman. We are grateful to Richard McBee for his presentation this past Tuesday night of artistic representations of the Akeidah. Wednesday, November 7th - Rabbi Bellino continues his classes in Foundations of Shabbat (7:00 PM) and Literary Study of Talmudic Legends (8:00 PM). Next Thursday, November 8th - 8:00 PM: The Drawings, Paintings, and Torah of Jessica Tamar Deutsch: Join us as we celebrate and discuss the drawings, paintings and Torah of Jessica Tamar Deutsch, a New York based artist whose work explores the intersection of ancient Jewish practice and contemporary culture. Please RSVP on the event page. Torah Readers: We are looking for men who can prepare to read at Shabbat Mincha (and possibly at Shacharit during the week as well) throughout the year. A schedule of readers is being maintained. If you can commit to any dates, please contact Rabbi Bellino. We are grateful to Jeremy Newberger who will read this week. The next available Mincha leining is on November 10th (the afternoon reading is Vayetzei). We are looking for women to prepare aliyot for a Women’s Torah Reading in the near future. Rabbi Bellino is happy to help anyone learn how to prepare a reading. Our plentiful and delicious Kiddushes on Sixth Street greatly enhance our synagogue and community. To sponsor or to co-sponsor a Friday night Kiddush, a Shabbat Kiddush, a Shabbocktail, our Shabbat Shabeer supply, or a Seudah Shelishit, contact Rabbi Bellino. The next available Shabbat Kiddush for sponsorship is Shabbat Toldot, November 10th. The Wednesday night classes in Foundations of Judaism will meet tonight, Wednesday, October 31st. Rabbi Bellino will also continue his new class at 8:00 PM in Rabbinic Storytelling, focusing on a literary analysis of the stories told by the Rabbis of the Talmud. Mincha/Kabbalat Shabbat - this week at 5:45 PM - is held shortly after candle-lighting time. Please join us this Shabbat and enjoy a beautiful davening, thoughtful Torah study, and a wonderful community. This week we observe Pink Shabbat, the Sharsheret-initiated annual Sabbath when we raise breast-cancer awareness. Please join us for our Shabbocktail - The Pink Warrior - in memory of our beloved friend, Rochelle Shoretz. Please consider donating to Rabbi Bellino's Discretionary Fund so that he may make a significant synagogue donation to Sharsheret, the organization she founded. We wish a Mazal Tov to Olivia Paris Garcia upon her engagement to Samuel Volkin. We offer Blessings of Consolation to the Gerschel Family upon the passing of Daniel's beloved Grandmother, Rachel Feldman. THIS TUESDAY, October 30th - Richard McBee: Imagining the Akeida The piety, devotion, and protest of the Akeida - the binding of Issac - have inspired many artisans to recreate this famous biblical scene. Join Richard McBee as he presents his "Top Ten List" of the classics as well as ten pieces of his own. Pizza and beer will be served. RSVP please. THIS WEDNESDAY, October 31st - Rabbi Bellino continues his Foundations of Shabbat (7:00 PM) and his Literary Study of Talmudic Legends (8:00 PM). We will hold Tot Shabbat next Shabbat! Children and their parents are invited to Tot Shabbat next Shabbat, November 3rd, featuring our newly hired Early Childhood Educator, Leat Klingman. Please join us for open play in the Beit Medrash at 10 AM, followed by the formal Tot Shabbat program promptly at 10:45 AM. Parent participation and feedback helps us create a nurturing and educational environment for our youngest members--so join us on November 3rd! Torah Readers: We are looking for men who can prepare to read at Shabbat Mincha (and possibly at Shacharit during the week as well) throughout the year. A schedule of readers is being maintained. If you can commit to any dates, please contact Rabbi Bellino. We are grateful to Rabbi Bellino who will read this week. The next available Mincha leining is on November 10th (the afternoon reading is Vayetzei). We are looking for women to prepare aliyot for a Women’s Torah Reading in the near future. Rabbi Bellino is happy to help anyone learn how to prepare a reading. Join us as we celebrate and discuss the drawings, paintings and Torah of Jessica Tamar Deutsch, a New York based artist whose work explores the intersection of ancient Jewish practice and contemporary culture. Please RSVP on the event page. Theater for the New City presents THE OPEN GATE, a musical adaptation of Nobel Prize-winning author Isaac Bashevis Singer's novel The Manor, on Sunday October 14th, at Theater for the New City (155 First Avenue at 10th Street). Written and directed by David Willinger, THE OPEN GATE has music composed by our member Arthur Abrams and choreography by Michael Vazquez. The show will play a limited engagement through October 27th. Visit the theater's website for more info and tickets. Foundations Classes & New Rabbinic Storytelling Class Tonight! The Wednesday night classes in Foundations of Judaism will meet tonight, Wednesday, October 24th. Rabbi Bellino will also start a new class at 8:00 PM in Rabbinic Storytelling, focusing on a literary analysis of the stories told by the Rabbis of the Talmud. "Living in an Uncertain World"
Mincha/Kabbalat Shabbat - this week at 5:55 PM - is held shortly after candle-lighting time. Please join us this Shabbat and enjoy a beautiful davening, thoughtful Torah study, and a wonderful community. This Shabbat we welcome Dr. David Bernstein, the Dean of the Pardes Institute of Jewish Studies (an open, co-ed and non-denominational Jewish learning community, based in Jerusalem and with programs worldwide), as our Shabbat Scholar-in-Residence. We are grateful to Ellen R. Cherrick and Alan Schwartz for sponsoring the Friday night Community Dinner. We wish a Mazal Tov to Brina Breitbart & Moshe Teitz on their recent wedding. Last week's Eshel Shabbaton was well attended and inspiring. We are thankful to: Rabbi Steve Greenberg, Miryam Kabakov, and Dana Friedman of Eshel, for their hard work in organizing the Shabbaton; Dr. Michelle & Rabbi Yehuda Sarna for their insights; and Alan Schwartz & Michael Sarid for their sponsorship. Tot Shabbat This Shabbat! Children and their parents are invited to Tot Shabbat this Shabbat, October 20th, featuring our newly hired Early Childhood Educator, Leat Klingman. Leat was born and raised in Israel and has taught in schools and synagogues in New York for the last 15 years. Leat brings professionalism and structure to our Tot Shabbat program which was parent led over the summer and received rave reviews. Please join us for open play in the Beit Medrash at 10 AM, followed by the formal Tot Shabbat program promptly at 10:45 AM. Parent participation and feedback helps us create a nurturing and educational environment for our youngest members--so join us on October 20th! Sixth Street Parents Committee: Our Sixth Street parents committee is planning a number of events for our youngest members and the larger community, and we want you to know about them! The Sixth Street Parents Google group is where events are publicized, meetings are called, and babysitters' contacts are shared. If you'd like to be added to the group, please email jeremy.watman@gmail.com. Torah Readers: We are looking for men who can prepare to read at Shabbat Mincha (and possibly at Shacharit during the week as well) throughout the year. A schedule of readers is being maintained. If you can commit to any dates, please contact Rabbi Bellino. We are grateful to Jeremy Watman who will read this week. The next available Mincha leining is on November 3rd (the afternoon reading is Toledot). We are looking for women to prepare aliyot for a Women’s Torah Reading in the near future. Rabbi Bellino is happy to help anyone learn how to prepare a reading. Our plentiful and delicious Kiddushes on Sixth Street greatly enhance our synagogue and community. To sponsor or to co-sponsor a Friday night Kiddush, a Shabbat Kiddush, a Shabbocktail, our Shabbat Shabeer supply, or a Seudah Shelishit, contact Rabbi Bellino. The next available Shabbat Kiddush for sponsorship is Shabbat Vayera, October 27th. Wednesday, October 24th (6:30 PM) - Jewish Harlem Lecture with Justin Ferate - The Lower East Side Jewish Conservancy will host a slide presentation and lecture on Jewish Harlem. Your armchair tour will be presented by Urban Historian, Justin Ferate, well known and highly respected for his professional in-depth knowledge about the myriad aspects of New York City. RSVP please. The piety, devotion, and protest of the Akeida - the binding of Issac - have inspired many artisans to recreate this famous biblical scene. Join Richard McBee as he presents his "Top Ten List" of the classics as well as ten pieces of his own. Pizza and beer will be served. RSVP please. RABBINIC STORY TELLING: A literary analysis of the stories told by the Rabbis of the Talmud. Wednesdays 8:00-9:00 PM. Begins this week! The Museum of Jewish Heritage is showing a series of poignant animated short films, in which our member and filmmaker Sarah Kamaras tells the stories of Holocaust survivors who were forced to flee their small town of Podkamien, Poland during World War II—and explores the history of her own family. Following a screening of her remarkable work, Kamaras is joined by Noah Lederman (author of A World Erased: A Grandson’s Search for His Family’s Holocaust Secrets) for a conversation about the “third generation.” Please see the Musuem's event page for more info and to register. The Wednesday night classes in Foundations of Judaism will not meet tonight, October 17th. Classes will resume on October 24th. This week, on Shabbat Lekh Lekha, October 19th-20th, we welcome as our Shabbat Scholar-in-Residence, Dr. David Bernstein, the Dean of the Pardes Institue of Jewish Studies, an open, co-ed and non-denominational Jewish learning community, based in Jerusalem and with programs worldwide. Please join us on Friday night for a delicious and social Community Shabbat Dinner, and join us as well over Shabbat for a thought-provoking series of talks and discussions on pluralism, uncertainty, and a variety of contemporary issues. Reservations for the dinner should be made by Wednesday, October 17th. Avraham & Lot Might Say to a Divided Community"
Dr. David Bernstein holds a B.A. and M.A. in History and a Ph.D. in Religious Education from New York University. He also attended Yeshivat HaMivtar. David has been the Dean of Pardes since 1998. Previously, he was the director of Midreshet Lindenbaum, popularly known as Brovender’s, for 12 years. David was a Jerusalem Fellow at the Mandel School for Jewish Education in Jerusalem from 1996-1998. Before making Aliyah in 1984, David was the director of informal education at the Ramaz Upper School in New York City, where he created and taught a 2-year curriculum integrating world and Jewish history. Mincha/Kabbalat Shabbat - this week at 6:05 PM - is held shortly after candle-lighting time. Please join us this Shabbat and enjoy a beautiful davening, thoughtful Torah study, and a wonderful community. All services - this Shabbat - will be held in the main sanctuary. This Shabbat we welcome our friends from Eshel - an organization devoted to creating community and fostering acceptance for lesbian, gay, bisexual, and transgender Jews and their families within Orthodox communities. Shabbat will feature Dr. Michelle Sarna, Rabbi Yehuda Sarna, Rabbi Gavriel Bellino, Miryam Kabakov (Eshel Executive Director), Rabbi Steve Greenberg (Eshel’s Founding Director), and other guests as they present and explore the following topics: Are Yeshiva day schools changing? Eshel’s High School Pledge Project; Lessons learned from Parshat Noach; and The Religious and Cultural Implications of LGBTQ Inclusion within Orthodox communities. We wish a Mazal Tov to Bita Alaghebandan & Matthew Moinian on their wedding. We offer continued Blessings of Consolation to Dr. Ira Orgel & Andy Gelfand upon the passing of Ira's father, Eugene Orgel. Torah Readers: We are looking for men who can prepare to read at Shabbat Mincha (and possibly at Shacharit during the week as well) throughout the year. A schedule of readers is being maintained. If you can commit to any dates, please contact Rabbi Bellino. We are grateful to Eli Szus who will read this week. The next available Mincha leining is on November 3rd (the afternoon reading is Toledot). We are looking for women to prepare aliyot for a Women’s Torah Reading in the near future. Rabbi Bellino is happy to help anyone learn how to prepare a reading. Tuesday, October 16th (7:00 PM) - Rabbi Natan Slifkin Lecture: Rationalism vs. Mysticism On Tuesday, October 16th, we will welcome Rabbi Natan Slifkin, noted author of several works exploring the interface of Torah and natural science, who will speak on the topic: Rationalism vs. Mysticism - Schisms in Traditional Jewish Thought. Pizza and beer will be served. RSVP please. Shabbat, October 19-20th - Shabbat Scholar: Dr. David Bernstein - Next Shabbat we will welcome Dr. David Bernstein, the Dean of the Pardes Institue of Jewish Studies (an open, co-ed and non-denominational Jewish learning community, based in Jerusalem and with programs worldwide), as our Shabbat Scholar-in-Residence. Join us for a delicious and social Community Shabbat Dinner, and join us as well over Shabbat for a thought-provoking series of talks and discussions on pluralism, uncertainty, and a variety of contemporary issues. Register for the dinner here. With the conclusion of the month of Tishrei - and with it the High Holy Day season - so will conclude our Kol Nidrei fundraising campaign. To those of you who have participated and/or scheduled the payments of your pledge, we are deeply grateful for your support. You may stop reading this email. If you haven't yet pledged to our Kol Nidrei appeal, won’t you please consider doing so? Your support would go a long way in sustaining and improving this growing community and its 173 year old building. If you found our observance of this holiday season meaningful, or if you are generally appreciative of the good work we’re up to, please act now. To make a donation to our Kol Nidrei Appeal, please go to the donation page on our website (please use the charge type 'Kol Nidrei Appeal'), or send a check to: Sixth Street Community Synagogue, 325 East Sixth Street, New York, NY, 10003. In two weeks, on Shabbat Lekh Lekha, October 19th-20th, we welcome as our Shabbat Scholar-in-Residence, Dr. David Bernstein, the Dean of the Pardes Institue of Jewish Studies, an open, co-ed and non-denominational Jewish learning community, based in Jerusalem and with programs worldwide. Reservations for the dinner should be made by Tuesday, October 16th. "The Limits of Pluralism, Peace, and Love"
Ethel Lebewohl (עטיל ליבא בת יוסף). Mincha/Kabbalat Shabbat - this week at 6:15 PM - is held shortly after candle-lighting time. Please join us this Shabbat and enjoy a beautiful davening, thoughtful Torah study, and a wonderful community. Tot Shabbat is this Shabbat! Children and their parents are invited to the first Tot Shabbat of 5779 this Shabbat, October 6th, featuring our newly hired Early Childhood Educator, Leat Klingman. Leat was born and raised in Israel and has taught in schools and synagogues in New York for the last 15 years. Leat brings professionalism and structure to our Tot Shabbat program which was parent led over the summer and received rave reviews. Please join us for open play in the Beit Medrash at 10 AM, followed by the formal Tot Shabbat program promptly at 10:45 AM. Parent participation and feedback helps us create a nurturing and educational environment for our youngest members--so join us on October 6th! We wish a Mazal Tov to our Simchat Torah Honorees: Sam Jesselson (Chatan Torah), Zach Griff (Chattan Beraishit), and Jeremy Watman (Kol HaNearim). Tanakh Yomi begins this Shabbat! Here's how it works: Follow the Torah reading every Shabbat, read approximately 3 chapters of Prophets/Writings Sunday thru Friday, and you will finish the entire Bible within a year. Click here for the Schedule. It includes the daily readings as well as several days after each book for rest and "catch-up." Please plan for your completion of Tanakh on Shabbat Nitzavim, September 29th, 2019. A full schedule of services, meals, and study sessions will be made available shortly. If you can host a guest in your home, please email Eshel at berina@eshelonline.org. Torah Readers: We are looking for men who can prepare to read at Shabbat Mincha (and possibly at Shacharit during the week as well) throughout the year. A schedule of readers is being maintained. If you can commit to any dates, please contact Rabbi Bellino. We are grateful to Elie Yudewitz who will read this week. The next available Mincha leining is on October 13th (the afternoon reading is Lech Lecha). We are looking for women to prepare aliyot for a Women’s Torah Reading in the near future. Rabbi Bellino is happy to help anyone learn how to prepare a reading. All are invited to attend a special weekend with members of the Eshel community; a weekend of learning, celebrating, and discussion about LGBTQ inclusion within Orthodoxy. On Tuesday, October 16th, we will welcome Rabbi Natan Slifkin, noted author of several works exploring the interface of Torah and natural science, who will speak on the topic: Rationalism vs. Mysticism - Schisms in Traditional Jewish Thought. The Wednesday night classes in Foundations of Judaism will not meet tonight, October 3rd. Classes will resume on October 17th. Mincha/Kabbalat Shabbat - this week at 6:25 PM - is held shortly after candle-lighting time. Please join us this Shabbat and enjoy a beautiful davening, thoughtful Torah study, and a wonderful community. Hoshana Rabbah: Shacharit will start at 7:30 AM this Sunday. There are all sorts of activities planned for this next round of Yom Tov. Please join us! Community Simchat Torah Party & Hakafot - Expect snacks, drinks, and a great crowd. Hakafot will begin at approximately 7:30 PM. To help us throw the best party ever, come and bring your friends and/or help us by sponsoring. Monday, October 1st, starting at 6:00 PM. Simchat Torah Kids' Dinner - The little ones need real food, so bring them for some kid friendly food and all the grape juice you'll let them drink. Kindly RSVP on the event page so we know how much food to prepare. Monday, October 1st, at 6:00 PM. Women's Torah Reading and Aliyot - Our Sixth Street Women will meet in the Beit Midrash to read Torah and all women are invited for aliyot. If you are able to read any or all of it, let us know. If you are unsure of the procedure, please click here for an instructional video. Tuesday, October 2nd, at 10:30 AM. Kids' Hakafa - The Kommunity Kinder will dance their way to their own Aliyah. It's literally the cutest thing that happens all year. Tuesday, October 2nd, at approximately 11:00 AM. There are many sponsorship opportunities for our Simchat Torah celebrations (Pre-Party, Party, Bar, Keg, Snacks, Kiddush, Advil). Please contact Rabbi Bellino for details. New Early Childhood Educator: We are excited to announce the hire of our new Early Childhood Educator, Leat Klingman. Leat was born and raised in Israel and has lived in New York City for 15 years. She has taught at East End Temple, JCP Downtown, and the Gateway school. Leat will be leading the Tot Shabbat program at Sixth Street, which had tremendous reviews and success during its parent-led pilot version earlier this year. Please join us for the first official Tot Shabbat program with Leat on Shabbat Bereishit, October 6th. Open play time will begin at 10:00 AM, and the structured program will begin promptly at 10:45 AM. The Kinder will make Kiddush before joining the congregation upstairs for Adon Olam. Programs like these succeed because of parent and child participation--so join us on October 6th! Torah Readers: We are looking for men who can prepare to read at Shabbat Mincha (and possibly at Shacharit during the week as well) throughout the year. A schedule of readers is being maintained. If you can commit to any dates, please contact Rabbi Bellino. We are grateful to Rabbi Bellino who will read this week. The next available Mincha leining is on October 6th (the afternoon reading is Noach). We are looking for women to prepare aliyot for a Women’s Torah Reading in the near future. Rabbi Bellino is happy to help anyone learn how to prepare a reading. Our plentiful and delicious Kiddushes on Sixth Street greatly enhance our synagogue and community. To sponsor or to co-sponsor a Friday night Kiddush, a Shabbat Kiddush, a Shabbocktail, our Shabbat Shabeer supply, or a Seudah Shelishit, contact Rabbi Bellino. The next available Shabbat Kiddush for sponsorship is Shabbat Lech Lecha, October 20th. Children and their parents are invited to attend the first Tot Shabbat of 5779 on Shabbat Bereishit, October 6th, featuring our newly hired Early Childhood Educator, Leat Klingman. Please join us for open play in the Beit Medrash at 10:00 AM, followed by the formal Tot Shabbat program promptly at 10:45 AM. Parent participation and feedback is encouraged to help us create a nurturing and educational environment for our youngest members--so join us on October 6th! Mincha/Kabbalat Shabbat - this week at 6:40 PM - is held shortly after candle-lighting time. Please join us this Shabbat and enjoy a beautiful davening, thoughtful Torah study, and a wonderful community. We wish a Mazel Tov to Lindsey & Rabbi Aviad Bodner upon the birth, Brit, and naming of a boy, נתן חיים. The Kommunity Kinderlach Sukkah Decorating Party this past Sunday was a lot of fun. We are grateful to Annie & Jeremy Watman for all their work in organizing the event. *The approximately 500 of you who chose to spend Yom Kippur with us! Sukkot is this Sunday night! Please join us in our beautiful Sukkah and for services (A full Sukkot schedule will be emailed on Saturday night). Sets of Four Species are available on the Lower East Side from our friends, the Shoshani Family, who are located outside of 26 Canal Street. You may reach the Shoshani Family at 212-673-2719 or 646-283-8665. Our plentiful and delicious Kiddushes on Sixth Street greatly enhance our synagogue and community. To sponsor or to co-sponsor a Friday night Kiddush, a Shabbat Kiddush, a Shabbocktail, our Shabbat Shabeer supply, or a Seudah Shelishit, contact Rabbi Bellino. The next available Shabbat Kiddush for sponsorship is Shabbat Chol HaMoed Sukkot, September 29th. Mincha/Kabbalat Shabbat - this week at 6:50 PM - is held shortly after candle-lighting time. Please join us this Shabbat and enjoy a beautiful davening, thoughtful Torah study, and a wonderful community. Please join us this Shabbat, at 6:20 PM, as Rabbi Bellino delivers the Shabbat Shuva Drasha entitled, Crying Fowl - The Kapparot Controversy. We wish a Mazel Tov to Henry & Rebecca Bahmani Fard on the Shalom Bat of their daughter, Rowwy Elizabeth (Eliorah Aryeh). We wish a Mazel Tov to Lindsey & Rabbi Aviad Bodner upon the birth of a boy. If you have not yet done so, please reserve your seats for Yom Kippur as soon as possible, as we anticipate a record number of people attending this year. We will make every effort to preserve your customary seats. Additional seats for members are $125 and all seats for non-members are $250. To reserve an additional seat, please go to the donate page on our website. To reserve a non-member seat, please register on the High Holy Days page. For Membership Renewal, please click here. For New Members, please click here. Schedule of Services: Please visit our High Holy Days page for a complete schedule of our Yom Kippur services. Yom Kippur Seating: To help you locate your seat(s) in advance, we're providing a link to our seating chart for the Yom Kippur services. To view your Yom Kippur seats, please click here. We have tried to preserve your customary seats and to accommodate your requests. If you do not see your name, the name of a guest, or notice any mistakes, please let us know as soon as possible so that we may take care of it. We plan to provide childcare on Tuesday, September 18th, from 6:00 PM to 9:30 PM and then on Wednesday, September 19th, from 9:30 AM to 1:30 PM, and then from 4:30 PM to 8:30 PM. Please remember that only parents and children are allowed in the Beit Midrash during these hours. Torah Readers: We are looking for men who can prepare to read at Shabbat Mincha (and possibly at Shacharit during the week as well) throughout the year. A schedule of readers is being maintained. If you can commit to any dates, please contact Rabbi Bellino. We are grateful to Rabbi Bellino who will read this week. The next available Mincha leining is on September 22nd (the afternoon reading is Vezot Habracha). We are looking for women to prepare aliyot for a Women’s Torah Reading in the near future. Rabbi Bellino is happy to help anyone learn how to prepare a reading. Our plentiful and delicious Kiddushes on Sixth Street greatly enhance our synagogue and community. To sponsor or to co-sponsor a Friday night Kiddush, a Shabbat Kiddush, a Shabbocktail, our Shabbat Shabeer supply, or a Seudah Shelishit, contact Rabbi Bellino. The next available Shabbat Kiddush for sponsorship is September 22nd (Ha'azinu). Join the Sixth Street Kommunity Kinderlach this Sunday, September 16th, at 10 AM, for Sukkot themed arts and crafts and a festive sing-a-long with Rabbi Bellino. Make a Sukka decoration to take home and leave one behind for the shul's Sukka. Free and open to the community. Light lunch will be served. The Wednesday night classes in Foundations of Judaism will not meet tonight, September 12th. We are on Summer Schedule, with Friday Mincha and Kabbalat Shabbat held at 7:00 PM (This will continue until September 14th!). Please join us this Shabbat and enjoy a beautiful davening, thoughtful Torah study, and a wonderful community. We wish a Mazel Tov to Dr. Leora Walter & Asher Schlusseberg on their wedding. We wish a Mazel Tov to Aliyah & Michael Gluckstadt on the birth, Brit, and naming of their son, Jonah Henry (יונה הירש). Please reserve your seats for the High Holy Days as soon as possible, as we anticipate a record number of people attending this year. We will make every effort to preserve your customary seats. Additional seats for members are $125 and all seats for non-members are $250. Rosh Hashana Seating: To help you locate your seat(s) in advance, we're providing a link to our seating chart for the Rosh Hashana services (Yom Kippur seating is a separate chart). To view your Rosh Hashana seats, please click here. We have tried to preserve your customary seats and to accommodate your requests. If you do not see your name, the name of a guest, or notice any mistakes, please let us know as soon as possible so that we may take care of it. Our Book of Remembrance is an opportunity for us all to enhance our Yizkor Service as we remember those who greatly impacted our lives. The booklet will contain the complete Yizkor Service and assorted readings and Psalms, your sponsored pages, half-pages, quarter pages and/or entry listings of those that you chose to honor and remember, and a message from Rabbi Bellino. Full Page: $180; Half Page: $108; Quarter Page: $54; Listing: $10 per entry. Please submit (English/Hebrew) names, relation, and yahrtzeit dates no later than September 13th. Please send all entries and any questions which you may have to us at: info@sixthstreetsynagogue.org. Torah Readers: We are looking for men who can prepare to read at Shabbat Mincha (and possibly at Shacharit during the week as well) throughout the year. A schedule of readers is being maintained. If you can commit to any dates, please contact Rabbi Bellino. We are grateful to Rabbi Bellino who will read this week. The next available Mincha leining is on September 8th (the afternoon reading is Vayelech). We are looking for women to prepare aliyot for a Women’s Torah Reading in the near future. Rabbi Bellino is happy to help anyone learn how to prepare a reading. Rosh Hashana is a long day - and lacking in kiddush. And there are so many new people to meet. Why not come back later in the day, at 5:30 PM on the first day of Rosh Hashana, for some honey cake and a cocktail? Please join us next Shabbat, Parshat Vayelech, at 6:20 PM, as Rabbi Bellino speaks about the controversial practice of Kapparot, the customary atonement ritual practiced by some Jews on the eve of Yom Kippur. All parents and children are invited to bring their artistic talents and join our Kommunity Kinderlach in decorating our Sukkah, on Sunday, September 16th, at 10 AM. AVOT: Rabbi Bellino will present the five chapters of Avot and Perek Kinyan HaTorah over the next 6 Shabbatot. After Shavuot he will teach Avot d'Rabbi Natan for the duration of the summer. Shabbat afternoons, 1 hour before Mincha. Rosh Hashana starts this coming Sunday night, September 9th. We look forward to welcoming you to our beautiful sanctuary and to our spiritual and meaningful services. To help you locate your seat(s) in advance, we're providing a link to our seating chart for the Rosh Hashana services (Yom Kippur seating is a separate chart). To view your Rosh Hashana seats, please click here. We have made every effort to preserve your customary seats and to accommodate your requests. If you do not see your name, the name of a guest, or notice any mistakes, please let us know as soon as possible so that we may take care of it. The Wednesday night classes in Foundations of Judaism will meet tonight, Wednesday, September 5th. We offer Blessings of Consolation to Shelly Shapiro on the loss of his sister Renee Shapiro. We wish a Mazel Tov to Shira Barzilay and Ram Levkovitz on the birth, Brit, and naming of their son, Daniel. We wish a Mazel Tov to Aliyah & Michael Gluckstadt on the birth of their son. Selichot: Please join us THIS Saturday night, September 1st, at 10:00 PM, as we begin saying Selichot, the penitential prayers for forgiveness and mercy, traditionally said during the week before Rosh Hashanah. High Holy Days/Membership Drive: Rosh Hashana is less than two weeks away, and so we ask that you renew your commitment to our synagogue in the form of Membership. Membership dues go a long way in making possible all of our synagogue's accomplishments. Won't you please share in our great legacy and help us continue our impressive revitalization? There are, of course, various membership options and we hope that one works for you. You can also mail a check to 325 East 6th Street, New York, NY 10003. Should you have any questions, please contact our treasurer, Alan Schwartz, or our Rabbi. Torah Readers: We are looking for men who can prepare to read at Shabbat Mincha (and possibly at Shacharit during the week as well) throughout the year. A schedule of readers is being maintained. If you can commit to any dates, please contact Rabbi Bellino. We are grateful to Neil Kitainik who will read this week. The next available Mincha leining is on September 8th (the afternoon reading is Vayelech). We are looking for women to prepare aliyot for a Women’s Torah Reading in the near future. Rabbi Bellino is happy to help anyone learn how to prepare a reading. The Wednesday night classes in Foundations of Judaism will not meet tonight, August 29th. The High Holy Day season is a time of repentance and atonement, contemplation and prayer. One of the strongest emotional moments that we experience this period, and especially on Yom Kippur, is the recalling of the memory of those loved ones who have meant so much to us and have gone on to eternal life. To enhance the Yizkor Service, our synagogue will again assemble our own Book of Remembrance. This is an opportunity for us all to remember those people (relatives, friends, teachers, etc.) who greatly impacted our lives. To view last year's book, click here. We urge all our members and friends to take part in our Book of Remembrance. The final date of submission for all entries must be no later than September 13, 2018. Please submit (English/Hebrew) names, relation, and yahretzeit dates. For full, half and quarter page entries, please consider adding a brief statement. If you wish to make the same dedication as last year, please let us know. We thank you in advance for your participation in this meaningful project.